This is the sixth and last design in the Hooking Up! ebook. It is the Starry Night Blanket, another design by special permission of the designer Amanda Perkins. I think it is the perfect first large blanket for a new crocheter. Many people make a granny square blanket as their first major blanket project. 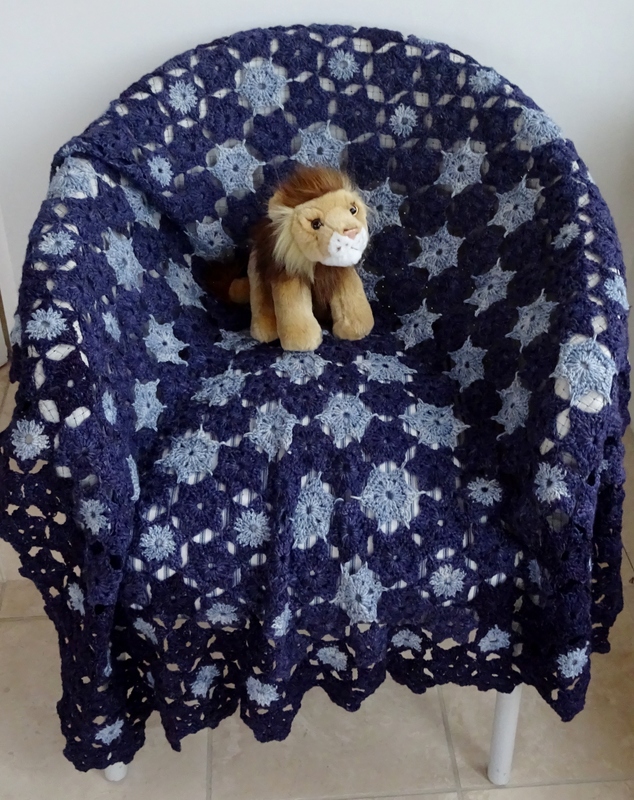 I am no different – my first blanket was a granny square design (in shades of blue). But I have found so much more enjoyment out of making a more unique blanket. I first saw this design in 2011 and I fell in love with it; it had been many years (too many to confess!) since I had made a blanket and I knew this was the one that would set me on the path of making them again. The photo is the Starry Night I made; it is a smaller version of the blanket design. Why? Well, Amanda’s blanket is a lovely shade of blue and uses variegated yarn to highlight the design but I decided I wanted a midnight blue and a sparkly star highlight for mine. Unfortunately I had difficulty finding the yarn I wanted in the quantity required – but I improvised with the quantity of yarn in the colours available and that is why mine a smaller version. I love the final effect I achieved, but I also love the original colours. So it seemed perfect to fit this in the book because I could show you how to make 2 sizes. Those of you who are less confident may wish to go for the smaller size (approx 110cm square), or maybe you just want something a little smaller. The original large design is approx 140cm by 150cm. So the choice is yours – large or small. Another reason this is a perfect fit for the book is that it builds on the techniques you will have learnt as you work through the book. The motif is hexagonal like the Cassia Cowl and joining is the ‘as you go’ method. And it really does make up quickly once you have made a few motifs. Amanda is the queen of crochet blankets, she has some beautiful designs in glorious colours. Quite coincidentally she is running a mystery blanket club this year for a star themed design – Zodiac. This club is now closed for those who want the complete package of yarn and design, but she has released the design (in monthly instalments) in her Etsy shop. I will be blogging about my progress on this in another post – meanwhile if you want to learn more have a look in her Etsy shop. I hope you have enjoyed following the designs in the Hooking Up! ebook. If you have just learnt to crochet, then I hope it will help you grow your craft and I would love to see what you make. PS Starry Night is also available as a single pattern here.